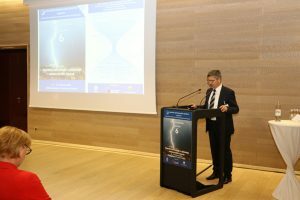 The sixth “Challenges in Meteorology” conference was held in Zagreb on November 15th and 16th 2018. The conference was organised by the Croatian Meteorological Society, the Croatian Meteorological and Hydrological Service, Croatia Control and the Department of Geophysics, Faculty of Sciences, University in Zagreb. As well as meteorological professionals and scientists in Croatia, the conference also attracted international participation. The event was supported by the European Meteorological Society (EMS) and Kraš Food Industry Plc. President of Croatian Meteorological Society. Photo credit: Ivan Lukac (DHMZ). This year’s main topic “Advanced technology for solving meteorological challenges” highlighted the interconnections between meteorology on technology. Developments in meteorology follow developments in modern technology, and at the same time some developments in technology are stimulated by the needs in meteorology. Heinz Jürgen Punge (Karlsruhe Institute of Technology) – “Quantifying severe convective storm hazard in Europe”. the use of radar data in nowcasting. The use of satellite data in meteorology is widespread. Some presentations showed where satellite images were used to estimate damage caused by natural disasters and for convection nowcasting. In other presentations we saw how global climate models were used to study the effect of ENSO and the NAO on Europe and regional climate model simulations that were used for analyses of agroclimatic indices, drought, heating and cooling demands. Model data were also used to test methods such as bivariate bias correction and the SAL verification method. It is worth mentioning that the large ensemble of RegCM simulations used in a few studies would not be have been possible without the high performance computing (HPC) system VELEbit (named after Croatia’s largest mountain range), at the University of Zagreb Computing Center (Srce). This is another great example of how meteorology and technology are inseparable. Other model-based presentations included the evaluation of numerical weather prediction models in different setups. It was stressed in the discussions that the most reliable data for climate model validation are gridded data obtained from station measurements. Apart from their use in model validation, such data are of great importance in climate monitoring and climate change analyses. In order to have more accurate gridded data on finer temporal and spatial resolution, denser station networks, as well as representative locations of stations, are necessary. In accordance with that, modernisation of the National Weather Observing Network of Croatia is planned as part of the METMONIC project. This project will ensure more homogeneous coverage of meteorological, oceanographic and radar measurements over both land and sea territories of Croatia. 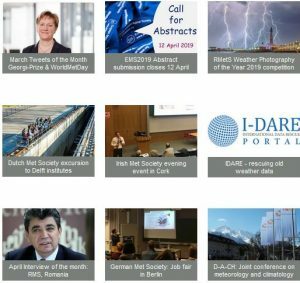 We are already looking forward to the next Challenges in Meteorology conference and to seeing the first results obtained using the new data collection systems of the improved observing network.